born 17 September 1950) is the 15th and current Prime Minister of India, in office since 26 May 2014. Modi, a leader of the Bharatiya Janata Party (BJP), was the Chief Minister of Gujarat from 2001 to 2014 and is the Member of Parliament (MP) from Varanasi. He led the BJP in the 2014 general election, which gave the party a majority in the Lok Sabha (the lower house of the Indian parliament) – a first for any party since 1984 – and was credited for October 2014 BJP electoral victories in the states of Haryana and Maharashtra. The prime minister, a Hindu nationalist, is a member of the Rashtriya Swayamsevak Sangh (RSS) and is a controversial figure domestically and internationally; his administration was criticised for its failure to prevent the 2002 Gujarat riots. Although Modi's economic policies (credited with encouraging economic growth in Gujarat) have been praised, his administration has also been criticised for failing to significantly improve the human development in the state. 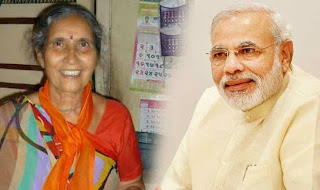 The third of six children, Modi has two elder brothers, Som (b. 1944) and Amrit (b. 1948). He has a younger sister, Vasanti (b. 1952) and two younger brothers, Prahlad (b. 1955) and Pankaj (b. 1958). In accordance with Ghanchi tradition, Modi's marriage was arranged by his parents when he was a child. He was engaged at age 13 to Jashodaben Chimanlal, marrying her when he was 18. They spent little time together and grew apart when Modi began two years of travel, including visits to Hindu ashrams. Reportedly, their marriage was never consummated and he kept it a secret because otherwise he could not have become a 'pracharak' in the puritan Rashtriya Swayamsewak Sangh (RSS). Although Modi kept his marriage secret for most of his career, acknowledging his wife when he filed his nomination for a parliamentary seat in the 2014 general elections. 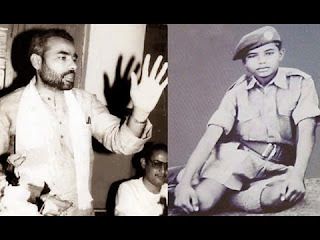 Modi was born on 17 September 1950 to a family of grocers in Vadnagar,Mehsana district, Bombay State (present-day Gujarat). His family belonged to the Ghanchi-Teli (oil-presser) community, which is categorised as an Other Backward Class by the Indian government. He was the third of six children born to Damodardas Mulchand (1915-1989) and Heeraben Modi (b. c. 1920). As a child Modi helped his father sell tea at the Vadnagar railway station, and later ran a tea stall with his brother near a bus terminus. He completed his higher secondary education in Vadnagar in 1967, where a teacher described him as an average student and a keen debater with an interest in theatre. An early gift for rhetoric in debates was noted by teachers and students. 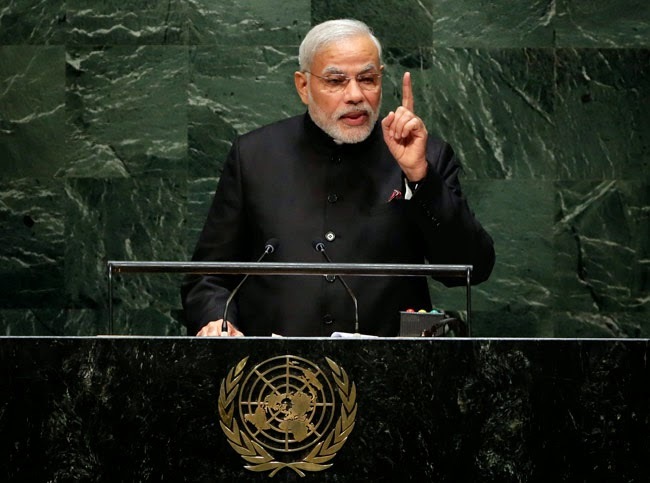 Modi preferred playing larger-than-life characters in theatrical productions, which has influenced his political image. At age eight Modi discovered the RSS, and began attending its local shakhas (training sessions). There he met Lakshmanrao Inamdar, popularly known as Vakil Saheb, who inducted him as an RSS balswayamsevak (junior cadet) and became his political mentor. 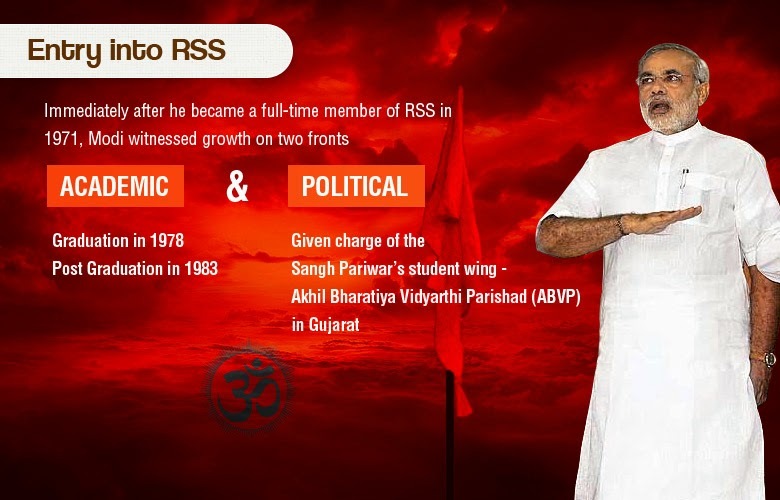 While Modi was training with the RSS he also met Vasant Gajendragadkar and Nathalal Jaghda, Bharatiya Jana Sangh leaders who were founding members of the BJP's Gujarat unit in 1980. Engaged while still a child to a local girl, Jashodabehn, Modi rejected the arranged marriage at the same time he graduated from high school. The resulting familial tensions contributed to his decision to leave home in 1967. He spent the ensuing two years travelling across northern and north-eastern India, though few details of where he went have emerged. In interviews, Modi has described visiting Hindu ashrams founded by Swami Vivekananda: the Belur Math near Kolkata, followed by the Advaita Ashrama in Almora and the Ramakrishna mission in Rajkot. He remained only a short time at each, since he lacked the required college education. Reaching the Belur Math in the early summer of 1968 and being turned away, Modi wandered through Calcutta, West Bengal and Assam, stopping by Siliguri and Guwahati. He then went to the Ramakrishna ashram in Almora, where he was again rejected, before travelling back to Gujarat via Delhi and Rajasthan in 1968-69. Sometime in late 1969 or early 1970, Modi returned to Vadnagar for a brief visit before leaving again for Ahmedabad. There he lived with his uncle, working in the latter's canteen at the Gujarat State Road Transport Corporation. In Ahmedabad Modi renewed his acquaintance with Inamdar, who was based at Hedgewar Bhavan (RSS headquarters) in the city. After the Indo-Pakistani War of 1971, he stopped working for his uncle and became a full–time pracharak (campaigner) for the RSS. In 1978 Modi became an RSS sambhaag pracharak (regional organiser), and received a degree in political science after a distance-education course from Delhi University. Five years later, he received a Master of Arts degree in political science from Gujarat University. On 26 June 1975, Prime Minister Indira Gandhi declared a state of emergency in India which lasted until 1977. During this period, many of her political opponents were jailed and opposition groups (including the RSS) were banned. Aspracharak in-charge of the Akhil Bharatiya Vidyarthi Parishad (ABVP), the student wing of the RSS, Modi was forced to go underground in Gujarat and frequently traveled in disguise to avoid arrest. He became involved in printing pamphlets opposing the government, sending them to Delhi and organising demonstrations. During this period Modi wrote a Gujarati book, Sangharsh ma Gujarat (The Struggles of Gujarat), describing events during the Emergency. He was assigned by the RSS to the BJP in 1985. In 1988 Modi was elected organising secretary of the party's Gujarat unit, marking his entrance into electoral politics. He rose within the party, helping organise L. K. Advani's 1990Ayodhya Rath Yatra in 1990 and Murli Manohar Joshi's 1991–92 Ekta Yatra (Journey for Unity). As party secretary, Modi's electoral strategy was considered central to BJP victory in the 1995 state assembly elections. In November of that year Modi was elected BJP national secretary and transferred to New Delhi, where he assumed responsibility for party activities in Haryana and Himachal Pradesh.The following year, Shankersinh Vaghela (one of the most prominent BJP leaders in Gujarat) defected to the INC after losing his parliamentary seat in the Lok Sabha elections. Modi, on the selection committee for the 1998 Assembly elections in Gujarat, favoured supporters of BJP leader Keshubhai Patel over those supporting Vaghela to end factional division in the party. His strategy was credited as key to the BJP winning an overall majority in the 1998 elections, and Modi was promoted to BJP general secretary (organisation) in May of that year. In 2001, Keshubhai Patel's health was failing and the BJP had lost seats in the by-elections. Allegations of abuse of power, corruption and poor administration were made, and Patel's standing had been damaged by his administration's handling of the 2001Bhuj Earthquake. The BJP national leadership sought a new candidate for chief minister, and Modi (who had expressed misgivings about Patel's administration) was chosen as a replacement. Although senior BJP leader L. K. Advani did not want to ostracise Patel and was concerned about Modi's lack of experience in government, Modi declined an offer to be Patel's deputy chief minister and told Advani and Atal Bihari Vajpayee he was "going to be fully responsible for Gujarat or not at all". On 3 October 2001 he replaced Patel as Chief Minister of Gujarat, with the responsibility of preparing the BJP for the December 2002 elections. As Chief Minister, Modi favoured privatisation and small government; this was at odds with political commentator Aditi Phadnis' description of the RSS as anti-privatisation and anti-globalisation. To attract foreign investment to Gujarat when he was chief minister Modi visited China, Singapore and Japan, travelling to China in November 2006 (to study the country's special economic zones, about to be implemented in Gujarat), September 2007 and November 2011. A month after his 2011 visit the Chinese government released 13 Indian diamond traders charged with smuggling in Shenzhen, with Modi attributing their release to his diplomacy and statesmanship. His relationship with many Western nations was troubled during his tenure as chief minister, with questions about his role in the 2002 riots resulting in travel bans to the UK, the US and the EU. Modi was barred from entering the United States under a provision of the Immigration and Nationality Act banning violators of religious freedom, the only person denied a US visa under this provision. The UK and the European Union refused to admit him because of what they saw as his role in the riots. As Modi rose to prominence in India, the UK and the EU lifted their bans in October 2012 and March 2013, respectively, and after his election as prime minister he was invited to Washington. In 2011 the Karachi Chamber of Commerce & Industry, impressed with development in Gujarat, invited Modi to visit Pakistan and address business leaders who asked him to consider a flight between Ahmedabad and Karachi because of the cultural and economic relationships between Gujarat and Sindh. Modi wanted to ease Pakistan's power crisis, (particularly in Sindh), and suggested that the country could follow the examples of the "Gujarat model" set by Gujarat Solar Park and the Kalpasar Project. In an April 2014 statement described as "unexpected", senior Pakistani diplomats told The Daily Telegraph that Modi was their choice for prime Minister "as he could provide the strong leadership necessary for peace talks"
Modi visited Japan in 2012. According to Ryohei Kasai, research fellow at the Center for South Asian Studies at Gifu Women's University, "There is a growing interest in Modi in Japan with much anticipation that he will reshape India by revitalising its economy and better governance. I believe Japan has an excellent relationship with him. Not only have successive Japanese ambassadors to India been regular guests in 'Vibrant Gujarat' investors' summit (organised biennially) but Japanese private companies also made a big amount of investment in the state. Modi played a significant role in the BJP's 2009 general-election campaign. On 31 March 2013 Modi was appointed to the BJP parliamentary board, the highest decision-making body in the party, and at the party's 9 June national executive meeting he was appointed chair of the BJP's central election campaign committee for the 2014 general election. Senior leader and founding member Lal Krishna Advani resigned his party posts after the appointment in protest of leaders who were "concerned with their personal agendas". His resignation, which was described by The Times of India as "a protest against Narendra Modi's elevation as the chairman of the party's election committee", was withdrawn the following day at the urging of RSS chief Mohan Bhagwat. In September 2013, the BJP announced that the chief minister would be their candidate for prime minister in the 2014 Lok Sabha election. Modi was a candidate in two constituencies: Varanasi and Vadodara. During the campaign, he pledged to speed government decision-making and remove bureaucratic hurdles which slowed development. He won in both constituencies, defeating Aam Aadmi Party leader Arvind Kejriwal in Varanasi and Madhusudan Mistry of the INC in Vadodara by 570,128 votes. The BJP-led NDA won the general election overall and the INC experienced its worst-ever defeat. Modi, who was unanimously elected leader of the BJP after his party's victory, was appointed prime minister by India's president. To comply with the rule that an MP cannot have two constituencies, he vacated the Vadodara seat. In what CNN described as "India's first social media election", Modi used Twitter, Facebook, Google Hangouts and holograms for campaign appearances. His victory tweet was the most re-tweeted in India. Modi was sworn in on 26 May 2014 at the Rashtrapati Bhavan. He was the first to invite all South Asian Association for Regional Cooperation leaders to attend his swearing-in ceremony. His first cabinet consisted of 45 ministers, 25 fewer than the previous government. Modi invited leaders of the SAARC countries to his swearing-in as prime minister to strengthen ties among its member states. Continuing his efforts to promote close relationships with neighbouring countries, his first foreign visit as prime minister was to Bhutan. Modi visited Nepal on 8 August 2014, and began a five-day trip to Japan on 30 August. On 17 September, Chinese President Xi Jinping arrived in India; financial memoranda of understanding and cooperation agreements between the countries were signed, which Modi called a new chapter in their economic relationship. The prime minister had a successful visit to the United States in the last week of September, which led to an improvement in relations between India and the US. 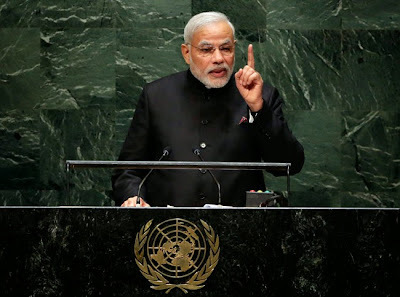 In a 27 September address to the United Nations General Assembly Modi asked for the adoption of 21 June as International Yoga Day, and a resolution doing so was approved by the 193-member body.